Industrial look of the spring spout for a gourmet kitchen. The modern pull-down faucet offers a high clearance below the spout for filling and cleaning large pots. High-arc spout swivels to offer complete sink access. The Glacier Bay Bodell Single Handle Laundry Faucet in Polished Chrome features an elegant, transitional style design that will add a decorative feel to both a laundry or kitchen dicor. Its single lever handle meets ADA standards for ease of use in adjusting water temperature and volume. The pull-down flex neck sprayer features an aerated spray and a new TurboSpray that is exclusive to Glacier Bay. The TurboSpray from Glacier Bay provides a stronger spray pattern than your standard pullout faucet. The sprayer also includes a removable connector for garden hose attachment. MOEN's Arbor line of kitchen faucets delivers streamlined functionality and timeless transitional styling. Presented in rich, oil-rubbed bronze, this Arbor Single-Handle Kitchen Faucet features a versatile pull-down spout that eliminates the need for a separate side spray, creating a clean and uncluttered look for your countertop. Designed to work seamlessly with your kitchen, it offers easy installation with 360-degree spout rotation, so the handle can be conveniently set on either the right or left side. 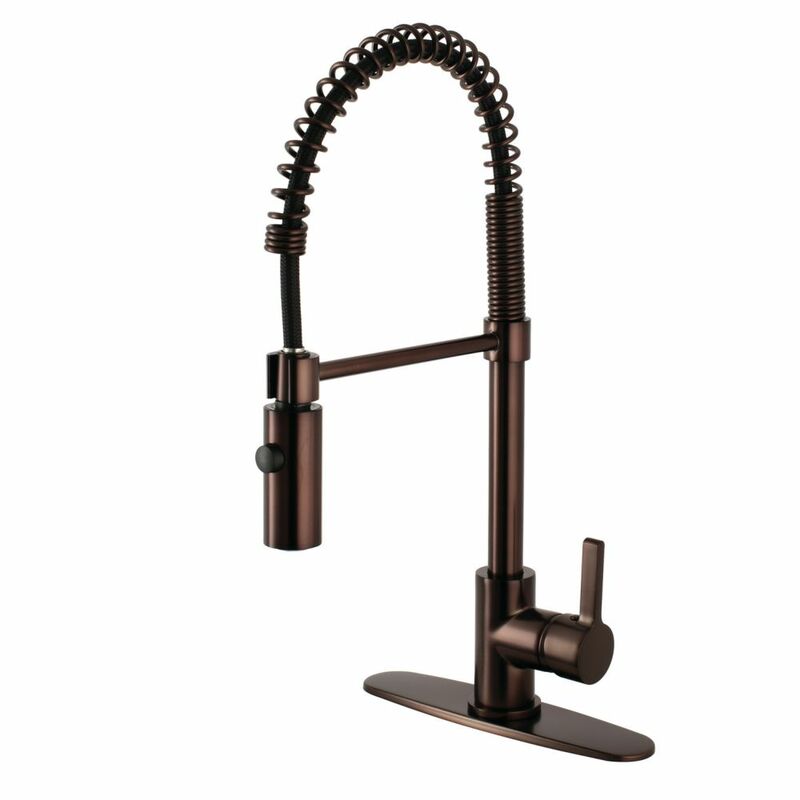 Continental Single-Handle Pull-Down Sprayer Kitchen Faucet in Oil Rubbed Bronze Industrial look of the spring spout for a gourmet kitchen. The modern pull-down faucet offers a high clearance below the spout for filling and cleaning large pots. High-arc spout swivels to offer complete sink access. Continental Single-Handle Pull-Down Sprayer Kitchen Faucet in Oil Rubbed Bronze is rated 3.8 out of 5 by 6. Rated 5 out of 5 by Ronnie from I am so happy I chose this faucet. I love the bronze finish and the overall look of it. It's di... I am so happy I chose this faucet. I love the bronze finish and the overall look of it. It's different from the typical faucet and I've gotten several compliments from friends about its unique look. Rated 5 out of 5 by happyinthefort from Classed up the kitchen a lot -- love not catching... Classed up the kitchen a lot -- love not catching the sprayer hose under the sink as with old sprayer! Rated 2 out of 5 by Melanie from This faucet is a painted brown color NOT a rubbed... This faucet is a painted brown color NOT a rubbed bronze as described Much lighter in color than expected and does not match the rest of my rubbed bronze in my kitchen. Looks cheap. Rated 2 out of 5 by Swik from Million Dollar Faucet I like the look of this faucet which is why I bought it....we had a handyman at our house doing other projects so we had him instal it. Hours (and $$$) later, it was partially installed. The hot water had to put shut off bc of a terrible leak and the cold leaked when on. Now we had to call a plumber but was it the faucet or the handyman? I overheard the plumber say it was a strange faucet and he's never seen the kind of connectors it has.....and is currently at the hardware store buying adapters. If this thing is ever actually installed it will have cost me $$$$$$$. Not excited.